These pointers can help calm even the worst teethers so everyone can get a good night’s sleep. Got a new teether on your hands? The pain of teething can keep your baby from getting much-needed rest, furthering the crankiness, tears and overall discomfort — not good for baby, not great for parents either. These s​ix tips can help calm the littlest teethers, relieving the pain and helping everyone get a better night’s sleep. Talk to your pediatrician if you have any questions or concerns. 1. Gum Massage: With clean hands, gently massage your baby’s gums, applying very light pressure. Even a small amount of counter-pressure can help alleviate sore gums. 2. Teething Toys: A variety of safe, effective teething toys are on the market, from plush toys perfect for chomping to rubber and silicone toys for maximum relief. 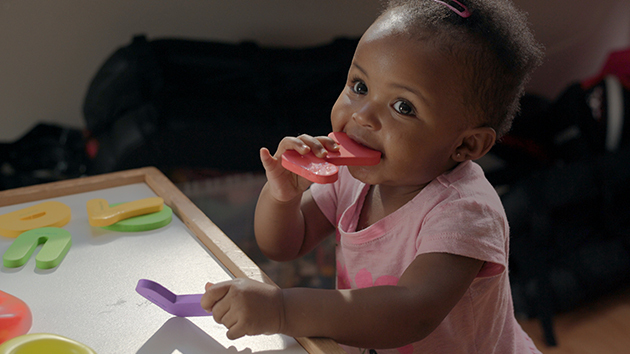 Look for kid-friendly patterns, shapes and colors to ensure your little teether takes to his/her new toy immediately. Be sure to read and follow the product directions. Note that the American Academy of Pediatrics recommends you not keep these toys in the freezer, because extreme cold can hurt your baby's mouth. 3. Vibrating Teethers: Like traditional teething toys, vibrating teethers are typically made out of silicone or rubber, and filled with water — pop in the fridge or freezer to chill before using. Not only do these teethers have a variety of textures, but they also vibrate when baby bites down. These vibrations have been found to soothe gums and relieve pain, while the cool center and multi-textured surface adds to the calming comfort. 4. Breastfeeding: If you breastfeed, consider upping your schedule at least for a few days during peak teething periods. For some babies, the sucking action associated with breastfeeding can help reduce some of the pain. That paired with the natural comfort that comes with breastfeeding makes for a simple go-to when teething discomfort increases. 5. OTC Remedies: There are various over-the-counter options available for teething and pain relief. Talk to your doctor if you have any questions and always read and follow the product label. ​6. Distractions! : When all else fails, consider the oldest teething trick in the book: a distraction. Sometimes a car ride, bath, walk around the block or some other activity that takes you out can be enough to calm baby and distract him/her from the discomfort.